50 watt halogen lights Qty 4 (+$405.00)	 ? Rectangle Shelf qty 2 (+$155.00)	 ? 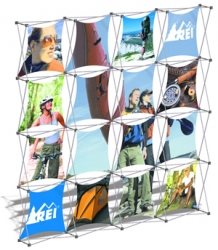 The Multi-Panel 11' Square Pop Up Tradeshow Display Booth is wildly popular with trade show and special event industry designers. Custom frame and graphic combinations are too numerous to catalog, so we’ve made it simple!